Flap barrier is a technical product which mainly provides intelligent and efficient people management for a passageway. It is a user-friendly access barrier. They provide for convenient contactless passage for people, even for luggage and handicapped wheel. The door closed immediately once the people passed through. It has the anti-tail and anti-passback function. The body is made of 100 % anti-corrosion SS 304. For the locations near the sea, we can customize 316 stainless steel casing. The flap barrier is driven by the motorized mechanism. The drive mechanism combines with the self-developed controller makes smooth operation and high performance. 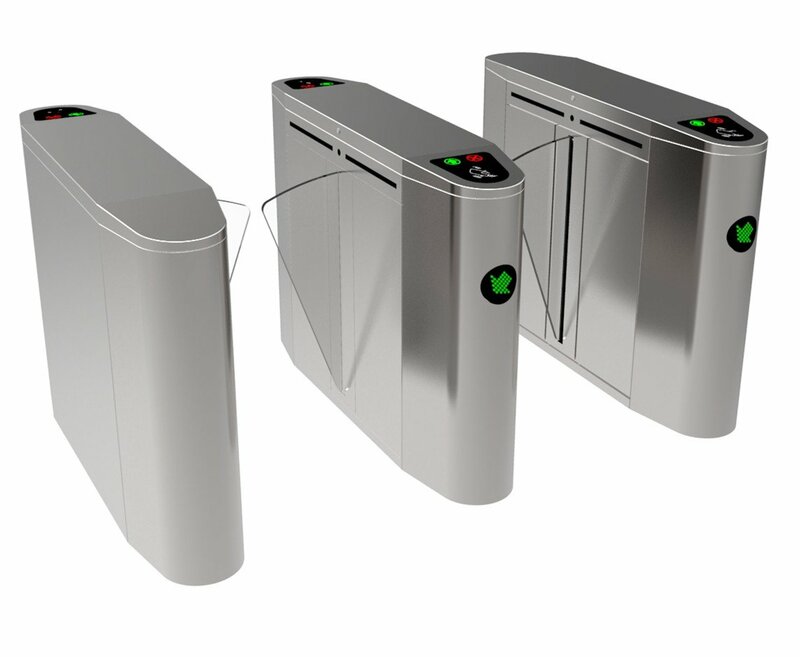 The gates can be mounted with the fingerprint system, RFID card reader system, facial recognition system, ticketing system, alarm system, which can all be interfaced with a PC through TCP-IP line. The flap barrier turnstile is also a fail-safe solution in case of power cutout off. To equipped with a battery, the flap arm will retract into the casing. The arm materials can be chosen from acrylic, tempered glass, soft PU. We can add LED light on the acrylic arm to be illuminated. When the gates are used for luggage/ handicapped lane, we will be equipped with double PU retract arms. So the lane width can be 900mm. The retractable sliding turnstile is equipped with different height of sliding arm. The max can be 1.8m. This product is designed with the functionality that suitable for office buildings, high-end neighborhoods, hotel, subway, cinema, and club, etc.